ALLOY STRIP SYSTEM (A & B) is a concentrated two part system made up of ALLOY STRIP (Part A), a blended alkaline powder and ALLOY STRIP (Part B), a solvent component. It is formulated to remove organic soils, and paint from either ferrous or non ferrous metals. 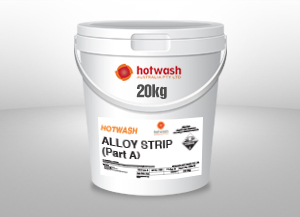 This ALLOY STRIP SYSTEM is designed for use in agitated immersion cleaning units. ALLOY STRIP is a concentrated two part system made up of ALLOY STRIP (Part A), a blended alkaline powder and ALLOY STRIP (Part S), a solvent component. It is formulated to remove organic soils, and paint from either ferrous or non ferrous metals. This ALLOY STRIP SYSTEM is designed for use in spray cleaning machines.